Fencing – it’s not just swinging a sword around but a sophisticated sport with a complex set of rules and three different types of weapon. There’s the foil, with a curved grip and shallow guard – foil fencers score points by thrusting the tip of the foil at their opponent, but only hits on the torso count. The épée is another thrusting weapon with a larger guard. The entire body of your opponent is the target area of the épée. The sabre is the final weapon, with a curved guard reaching to the end of the hilt. The target area of the sabre is anything from the waist up, but any part of the sabre can be used to score points, favoring swinging motions over thrusts. In 2016, U.S. sabre fencer Ibtihaj Muhammad won the Olympic Bronze, becoming the first Muslim-American woman to win an Olympic medal as well as the first to compete while wearing a hijab, the traditional Muslim veil. 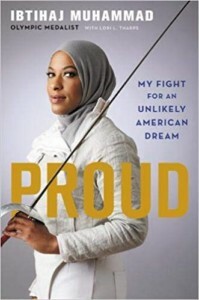 Her memoir, Proud: My Fight for an Unlikely American Dream (2018; 270 pages), details her struggles and her success. A young reader version was also published this year, but the full-length version is perfectly appropriate for middle schoolers and high schoolers. 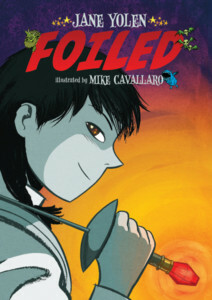 Jane Yolen’s graphic novel Foiled (2010; 160 pages) stars Aliera Carstairs, a color-blind fencing enthusiast who has trouble fitting in at school until she starts dating her handsome new biology partner Avery Castle. But Avery isn’t quite the Prince Charming he seems to be and on their first date Aliera is dragged into a fantasy world of heroes and monsters. A sequel, Curses! Foiled Again (2013; 158 pages) was also published. C.S. Pacat’s comic series Fence (2018; 112 pages ) is available for download through Hoopla. 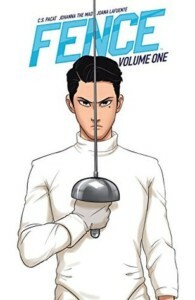 The series features rival fencers forced to room together at a boys’ boarding school. The series should be a big hit with lovers of anime – think Yuri!!! On Ice with fencing – or at least those who can get past a Manga-style story with American-style illustrations.